I have been watching Arvind Kejriwal's politics since the inception of his pet project Aam Aadmi Party. 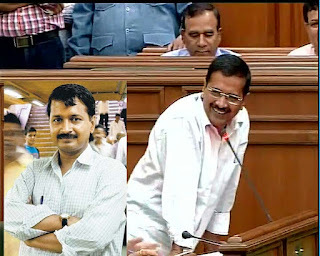 I have seen him struggling, I have seen him fighting, I have seen him taking battle to the opponents homeground, I have felt his emotional breakdown after people didn't choose his crystal clear non-corruptible politics, I have seen him rise again professionally and finally I have seen him compromising to the certain extent with the political reality of India and its people. Now, he has secured a mandate and heading a majority government in Delhi. But, people often ignore the experiences this guy had gone through his journey from April-May 2014 until the formation of provincial government in Delhi. He probably seen the heart less nation who is not ready to stand with him firmly on anti corruption issue. So, here came a point when the man had to change his ways. He realised the necessity of some compromises needed to be done in politics. In the process some of the guys like Prashant Bhushan and Yogendra Yadav who were not willing to diverge even slightly from core issues were sidelined. Meanwhile Delhi govt's advertisement budget is being utilised to promote Kejriwal not just across Delhi but across the major Indian cities via Newspapers ad. As per the statistics released, till June, 2015 end Kejriwal govt had spent Rs 526 crore which is larger amount than erstwhile Sheila Dixit lead Congress government. Also, one more compulsion in politics is that you fix your party office bearers or volunteers on some govt commissions or authorities. There are around 81 such cases where some posts with healthy emoluments were given to close people, one can cite an example of Delhi Jal Board authority. If you apply strictest rules of integrity and non corrupt behaviour then this behaviour too looks wrong. Having said all this, one can't deny the fact that slowly but steadily he's fulfilling his promises. From electricity bills, water, expenditure on health, education, marshals for women security to Wifi facility the things are happening smoothly. After fulfilling these promises, Kejriwal has set the stage for one more confrontation with Centre over the Full Statehood to Delhi. Bihar chief minister Nitish Kumar and CPI(M) have come close to anti corruption crusader in the meantime. It is very likely that issue will be raised by CPI(M) and JDU's Sharad Yadav in Rajyasabha in upcoming monsoon session. The thing which JDU and CPI(M) getting in return is the technological, strategic knowledge share by Kejriwal and team which will tell it's future in Bihar elections to be help in September this year. While Kejriwal is taking on centre and making it a Centre-State issue by creating a perception of attack on cooperative federalism Congress is not able to project opposition to union govt. Yes, Rahul Gandhi had shown some signs of revival but that is no match to expertise of an IITian. If things continue like this it is very likely that we will see a Neo front of AAP, JDU, CPM lead by Mr Kerjriwal going into 2019 battle which is very likely to open the gates of 7 RCR to this man. a20.nitin. Watermark theme. Powered by Blogger.